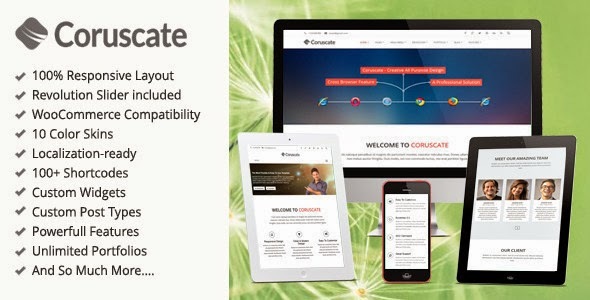 Coruscate is a 2 in 1 Multipurpose Responsive WordPress Theme. It’s an advanced, unique and powerful premium WordPress theme suited for personal onepage or multipage websites/blogs, business websites, shop websites, users who want a very nice portfolio website where they can showcase their work, or for any other purpose website. It’s fully responsive, flexible, clean, retina ready and professional design, Search Engine Optimized and comes with an advanced framework with tons of features and options in order to make your life easier and build your site very quickly. Search Engine Optimized – 100% compatible with most popular SEO plugins: Yoast and All in One SEO. This Theme is built with web standards and SEO best-practices in mind. Tons of Google, FontFaces and Cufon Fonts included. Backend color pickers included for nearly every element. Use Custom Background Images & Colors for every Page. Turn on / off the Responsive Layout. Item Reviewed: Coruscate - Multipurpose WordPress Theme 9 out of 10 based on 10 ratings. 9 user reviews.